With several best-selling original monologue books under his belt, screen writer, actor, and highly respected monologue/audition acting coach Glenn Altermann considers this his best book yet. These 48 monologues — evenly split between men’s and women’s — each tell a compelling story that has a beginning, a middle, and an end while presenting the actor with an identifiable emotional journey. 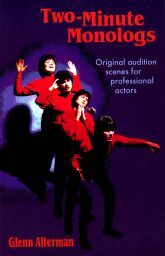 The wide variety of characterizations offers many choices for actors seeking challenging new roles in a professional audition length. The tones of these pieces range from gritty, real life drama to comedy, and have all been tested and fine-tuned to receive the most enthusiastic responses from both actors and directors. Winning duet scenes for practice, auditions, and competitions.